The first research to do is what species is right for you. Do you want a lizard, a snake, or a turtle? A vegetarian, insectivore, or carnivore? Are you willing to provide a very large cage, or do you have limited space? Asking yourself these questions will help narrow down your choices. For instance, that little iguana may look cute at the store, but it will quickly grow into a 4-6 foot lizard that has special dietary and habitat needs. Every animals needs should be considered when choosing a reptile. Once you have narrowed down your choices, you need more details on its care. Read as many care sheets as you can, and learn as much as possible about the care of the animals you are considering. You may find that an animal you previously thought was a good choice is not at easy to care for as you think. 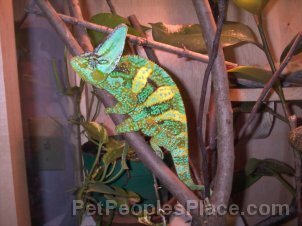 Chameleons are getting very popular, but they are not a good species for beginners. They require very high humidity, but an all-screen cage, which is a difficult combination. In a glass cage they don’t get enough ventilation, and they can be very stressed by seeing their own reflection in the glass. They often get picky about their insect prey and go on hunger strikes for no known reason. So before you make a decision, learn a species special needs. Now you know what you want, but don’t rush to the store just yet. What kind of cage do you need? What about food, heat, light, etc? You may have read some care sheets, but books are even better. Buy at least one or two books on your species, to get more information. Some even have some great tricks of the trade that a shorter care sheet may not mention. This will help you prepare for the next step-setting up the cage. Cage setup is an important step. 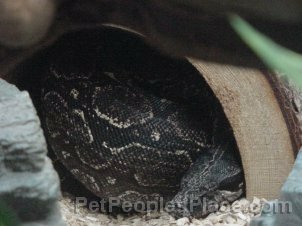 You want to do this at least a few days before getting your reptile, so you can monitor temperatures and adjust accordingly. Simple cages are often best at first, to monitor your animals health and prevent any parasites from hiding in decorations. Most species will do well in an aquarium lined with paper towels, with simple plastic hide boxes, and food and water dishes. This will let you check for things like mites on the skin and floor of the cage, parasites in the stool, etc. You can tailor this design to your reptiles needs. Some species, especially lizards and turtles, will need UV light. 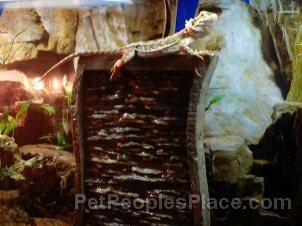 This can only be provided by a good reptile bulb, like a Reptisun 5.0, or an Active UV heat light. You will also need a heat source, which can be an overhead incandescent bulb, or an under tank heater. Heat rocks are not a good alternative. They tend to develop hot spots and can burn your pet. Use a good digital thermometer to measure temperatures. The plastic stick on kind sold for reptiles are often inaccurate. Measure temps several times a day for several days to check for any fluctuations that need to be adjusted. You will also need to have your food supply ready. Will you need veggies, insects, rodents, or a combination? Make sure you get your food from a reliable source. For herbivores, variety is the key. Use as many different ingredients as you can, and make sure it is washed thoroughly. Insects should be kept in a secure container, with nutritious food of their own for a few days before feeding them to your reptile. This will assure that the insects are a nutritious food source. Rodents should never be fed live to your reptile if at all possible. It takes only a second for a rodent to inflict a severe bite wound, and they can even kill a reptile. If you do not feel comfortable killing it yourself, try to find a good source of frozen rodents. These can be thawed and warmed before feeding, and are often an easier option, because you can buy in bulk and store them in your freezer, eliminating a weekly trip to the pet store for live rodents. Now that you have everything ready, it’s time to choose your animal. 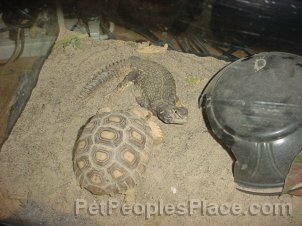 Pet stores are the most common source, but reptile shows and even online classifieds and websites are a good place to look. When selecting a pet, there are a few things to look for. Check for clear eyes, with no cloudiness or discharge. Keep in mind though, a snake getting ready to shed will have cloudy eyes. The animal should not appear thin or dehydrated. It should be active when handled, exploring it’s surroundings. If there are any droppings in the cage, check to make sure they are firm, not runny. Ask to see the animal eat. An animal that refuses food is likely ill, so avoid any animal that is not eating. A healthy reptile will not feel like a featherweight. They should have good weight for their size. Skin should be clean, with no pieces of old shed stuck, and no loose folds. Check for bits of skin around toes and tails. These are common areas for skin to get stuck. Now that you have your new pet, give it time to get used to its new home. For a few days, limit contact to feeding and cleaning. Watch for any signs of illness, like runny stools, loss of appetite, or lethargy. Remember that your pet may not eat as much at first, but within the first week it should be eating something. After your pet settles in, you can begin gentle handling for those species that will tolerate it. Remember that this is all new for both of you, so it may take time to get used to each other. You can start just by putting your hand in the cage, to get the animal used to your presence. After a few days, gently pick the animal up, but keep it in the cage and close to the floor of the cage in case it decides to jump. Once you are both comfortable with this, you can try taking it out of the cage. Some reptiles will be happy to sit with you, others will want to explore. Remember that they can and will squeeze into tiny spaces, so keep a close eye on your pet. If it seems to be getting stressed, it’s time for it to go back into the cage. You will learn how and when your pet likes to be handled. Remember that snakes should not be handled during shed periods and for a day or two after a meal. Reptiles can be great pets, if cared for properly. With a little research and preparation, they can live long, happy, and healthy lives. They are fascinating to watch, and even more fun to interact with! Jun 29, 2017 admin Comments Off on Should I Get an Exotic Pet?